And here comes another yet-unannounced Android smartphone for MetroPCS, this time known as the Samsung Galaxy S Lightray 4G (model number SCH-R940). Images of the device were leaked on Howard Forums, along with some of its hardware specifications and features. Does the device look familiar? Don't be surprised as the Lightray 4G shares a whole lot of similarities with the Samsung DROID Charge for Verizon, both in terms of looks and specs. What the Samsung Galaxy S Lightray 4G has to offer is a 4.3-inch Super AMOLED Plus display, the resolution of which has not been revealed. There is an 8-megapixel camera with LED flash on its back, and a 1.3MP front-facing shooter is located above its display. For all of the user's storage needs, a 16GB microSD card has been thrown in the set. As far as connectivity goes, the smartphone has all the basics covered, including HDMI-out and Mobile Hotspot. The Galaxy S Lightray 4G supports 4G LTE, as indicated in its FCC filing. Besides the screen's exact pixel count, we have another detail missing, namely the processor inside the Lightray 4G. Although none of the images say what kind of silicon we might expect, some say that the smartphone has a single-core chip clocked at 1.3GHz. 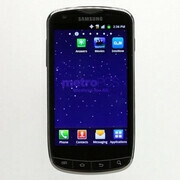 We can only hope for the device to launch with Ice Cream Sandwich out of the box, but judging by the snapshots, Gingerbread seems to be the Android flavor running on the Lightray 4G. And last but not least, the smartphone is said to be scheduled for a mid-August launch. Lets hope it has a newer processor than found on the Droid Charge. Thing became a lag feet in no time. While the Infuse had a second gen Hummer Bird processor at 1.2 it performed a lot better. meh, no thanks, i'm trying to get rid of a Charge.